Living Traditions Presentations Flagstaff, Arizona: Celtic Spring in Concert march 14! Celtic Spring in Concert march 14! One of the top five finalists from NBC’s America’s Got Talent will be performing in Flagstaff Friday, March 14, 2008 at Flagstaff High School’s Main Auditorium at 8:00pm. The group is called Celtic Spring, although sometimes they are referred to as the von Trapp family of Celtic music. And with good reason. Celtic Spring is a music and dance group comprised of six siblings and their parents. 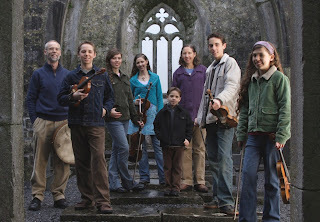 The Wood family has entertained audiences from national television to major festivals such as Milwaukee Irish Fest as well as across the nation and world. The Wood children, Elizabeth (21), Deirdre (19), Sean (16), Patrick (14), Maire (10), and Aidan (6), were born into a family of Irish descent (their mother’s grandparents came from Ireland) and reside in Southern California when they are not touring. Each child plays the fiddle and is a championship level Irish Step dancer. The performance they bring to audiences is filled with outstanding step dancing and equally outstanding fiddling. Celtic Spring’s awe-inspiring performances feature a rich variety of music from the Celtic lands and beyond, including original compositions. There will be a great variety of dancing from the kids, as well as fiddling, each taking turns to perform, and then performing a task attempted by many, but achieved by few….fiddling and dancing simultaneously. This talented family is a true inspiration to watch perform and will be enjoyed by people of all ages. As an educator and presenter, I would love to see more families attend events that are happening like this in our community, so I am encouraging your family to start off spring break and St. Patrick’s Day with the Wood family and Celtic Spring. To further encourage you, I am offering children’s tickets for only $5 each! Adult tickets are $25. Tickets for NACHS and FFOTM are $23 and NAU/CCC student tickets are $15. Tickets can be purchased at Cedar Music, Jitters Coffee, or by calling 928-600-1365 or emailing Kari@LivingTraditionsPresentations.com. I hope you will be able to join me for this family show of Irish-American talent! This post is likeable, and your blog is very interesting, congratulations :-).